Sun 'n Fun International Fly-In and Expo 2014 - Celebrating 40 years this week! 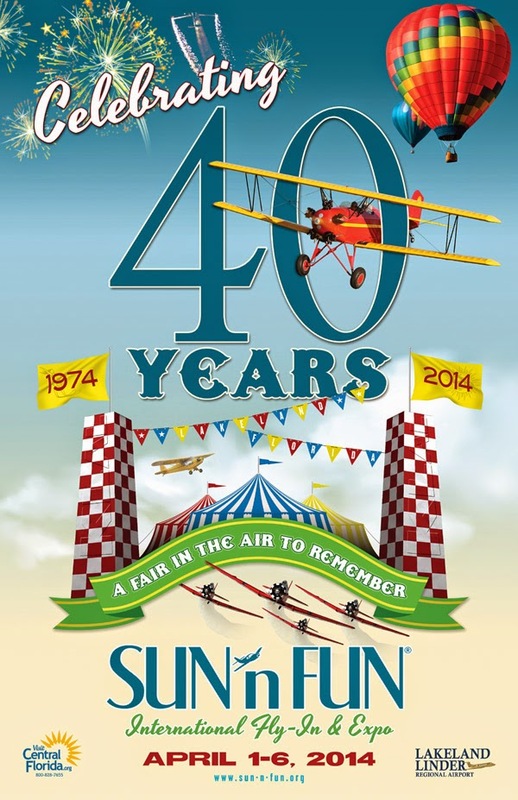 The annual Sun 'n Fun International Fly In and Expo is celebrating its 40th birthday this week April 1 - 6! Held every year at Florida's Lakeland Linder Regional Airport (LAL). It is one of the largest airshows in the world. If you plan on flying in, don't worry about the airport being full, they have never had to turn airplanes away. Visit 100s of exhibitors including, AOPA, EAA, Pilatus, Beechcraft, Soloy Aviation, Cessna, Piaggio, ForeFlight, Garmin, Flying Magazine, Quest Aircraft, SiriusXM just to name a few. Attend the job fair. Recruiters from major, regional and corporate flight departments will be there. General admission ticket prices are: Adults - $37, Youth (11-17) - $15, 10yrs and under - Free. Preferred seating is an additional $20. Well worth it I think. It gives you seating on the flightline, bag storage, a shade tent, access to bathrooms and free water all day. You can purchase your tickets online here. If you're flying there and have an extra seat or two or if you need a seat, Sun 'n Fun has a page/forum to help you out. Here is the link. Unfortunately I will not be able to make it out there this year. But I hope some of you can!